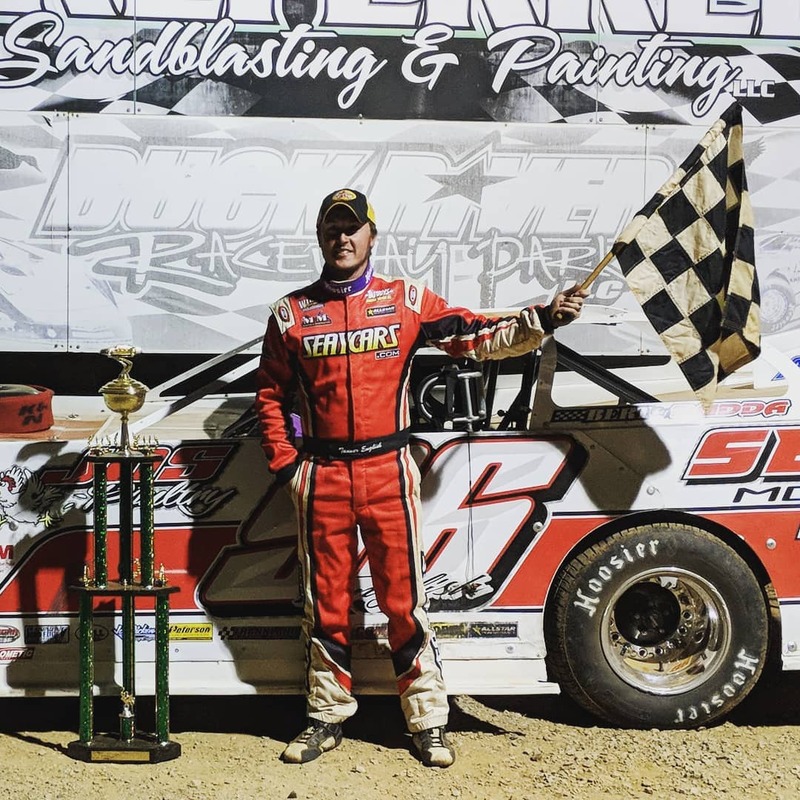 RACE RECAP: WHEEL, TN–The Southern All Star Dirt Racing Series returned to Duck River Raceway Park Saturday night for the first time since 2001 and the fans that packed the stands got a show from a father & son duo as Tanner and Terry English of Benton, KY., battled side by side for 15 laps till Tanner got the lead for good after a late race restart to get his first Southern All Stars Dirt Racing Series win in the Ducktona 40. They now are the fourth father and son duo to win Southern All Star events. They join Tony and T J Reaid, Billy and Billy Moyer Jr, and Jack and Travis Pennington. Local favorite and outside pole sitter Brad Skinner of Spring Hill, TN., checked out at the drop of the green but the Skinner but the Skinner bad luck continues as his transmission locked up and ended his night. Four time Southern All Stars Champion Riley Hickman made his first appearance with the series this season and they knew he was there as he was right behind the English cars battling with them and trying to get around them. Eric Hickerson of Linden, TN., also returned to the series and he did not disappoint as he came from his 9th starting spot to finish fourth. Jason Frame of Dechard, TN., also made his first start this year and got a fifth place finish. Jay Scott of Fayetteville, TN., came home in 6th spot and alto took over the Southern All Stars points lead, 7th Josh Putnam of Florence, AL., who made his first start with the series this year, 8th Corey Posey of Petersburg, TN., also on his first start with the series, 9th went to Allen Murrey of San Antonio, TX., form his 14th starting spot, and 10th went to Caleb Ashby of Cunningham, TN. Also like to thank drivers and fans that turned out at Duck River Raceway Park and also Ricky Spurgeon and his staff for helping out with everything and look forward to the return on June 30th. The next Southern All Star Dirt Racing Series event will be the first stop of the season at the Talladega Short Track in Eastaboga, AL., for the annual NASCAR Weekend 40 paying $4,000 to win on Saturday night April 28th.